Hanoi (VNA) – The 16th Hanoi Open Mathematics Competition (HOMC) concluded on April 5 with an award presenting ceremony held in the capital city. In the category for international competitors and two Vietnamese teams, the organising board presented 101 medals and 14 prizes for individuals, with 52 medals for the Junior group for eighth and ninth graders (9 gold, 17 silver and 26 bronze medals), and 49 medals for the Senior group for 10th graders (8 gold, 15 silver and 26 bronze medals). The two Vietnamese teams brought home a total of 23 gold medals. The Chinese team were the champions in the Junior group while the Indonesia team came first in the Senior group. 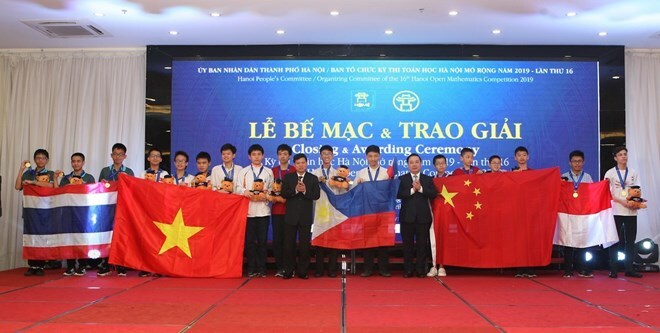 In the category for domestic competitors, a total of 300 medals and 16 prizes were presented, and the Hai Phong team won the team titles of both the Junior and Senior groups. This year, the three-day competition has attracted more than 600 students from 14 countries and territories, including Indonesia, Malaysia, China, Nepal, the Philippines, Hungary, Iran, Myanmar, Poland, Spain, Taiwan, Thailand, the United Arab Emirates, and host Vietnam.